The transition from print to web has been a challenging one for The Aviso AVW. Now that we're in our fourth semester under the new web format, things are beginning to come together. During my sophomore year, it was my job to post all the stories on TheAviso.org. However, the original website was very rough. There was very little that could be accomplished through it. Pictures were very difficult if not impossible to load, and it looked very unprofessional when the posts were finally uploaded. My junior year, we switched from being a print and web publication to an online-only publication. I was relieved to get rid of the old website and start a new fresh site for The Aviso, even though I was hesitant about getting rid of the print. But the new step into the future of technology was taken. 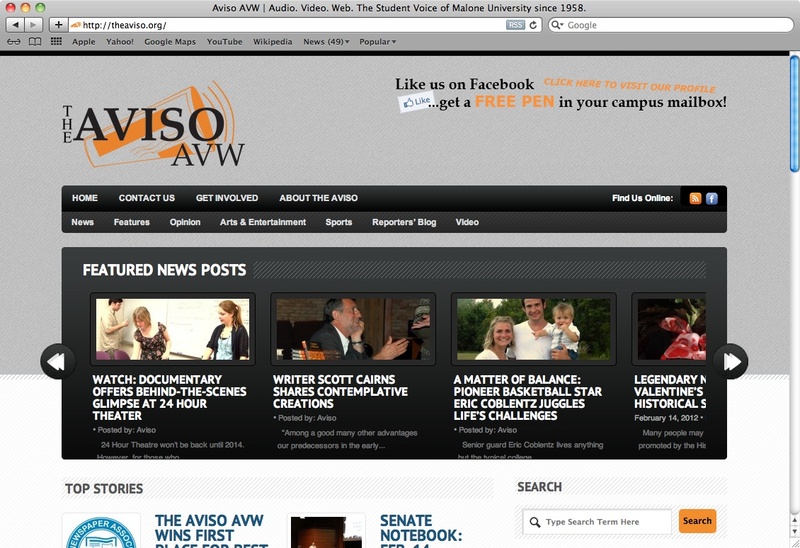 That year, The Aviso was using WordPress as their website host. I had the official title of web editor. All the stories and multimedia for the week was emailed to my account and I posted it online. At times, the newspaper wasn’t completely finished and posted until as late as 2 a.m. on Tuesday—the same day it was published online. The second semester, all the section editors began to upload the articles within their sections. This really spread out the workload and helped the editors do exactly what they wanted for posting the stories. Now that all the staff on the team is working together even more, I think the teamwork shows in the publication. If you are wondering what all the celebration is about The Aviso winning an award, read some articles and see what a team can do when they work together. Lisa Heath is features co-editor for The Aviso AVW. The Aviso has come a long, long way! If you don’t believe me, check out the library archives for the “old” Aviso issues! Hmmm . . . . that brings up a thought. How will The Aviso AVW be archived so that we can all look at issues years from now? Thanks for the comment! Our online articles are actually printed out and added to the archives in the library. We don’t really have any way of archiving videos, but the text and photos can be found there.